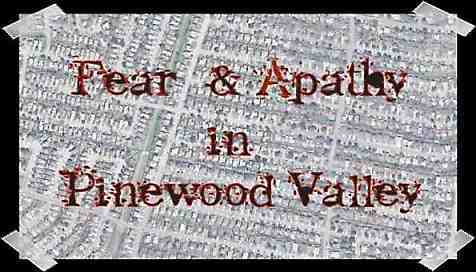 It took a single year to create Pinewood Valley, and two more to populate it. The For Sale signs came down from the graceless lawns. The station wagons and moving vans arrived, and with them came the lawsuits that assured the complete and utter stagnation of the community. Packed with the boxes, the women, the mothers, arrived with great expectations, a child in every hand and a bun in the oven. They did not see the clay and rocks, but the rather the visions of lawns, block parties, dark nights lit by patio lanterns and summers drinking by swimming pools. The men brought rakes and lawnmowers which could not be used. These are our pioneers. There were the men and the women who raped the land and built our nation. The Conestoga wagons of the history books mean nothing for they are an allusion to the spirit, a demented dream of lies and genocide. They are as thew wind that has passed long ago leaving behind only graveyards, dust and the dead dream of wilderness. Our pioneers arrived in Montegos, Cutlass Cruisers and Grand Prix. Our pioneers were not the builders of society but the builders of fences, barriers, patios and small four by eight sheds. The only Indians we knew lived down the street, and unlike those of the dead white ancestors, our Indians came from India proper.